My wedding coverage is a little different than most, because I don't offer wedding packages. I hold the philosophy that—as a wedding photographer—I should be more interested in my craft and your day than how many hours I'm clocking. I have an option A or B, if you will, and the only difference is having one or two photographers. Choosing your wedding photographer(s) is one of the most important decisions you'll make while planning your wedding. Yes, your dress will be amazing and you'll probably want delicious food—I believe those things do matter—but with the exception of your photos, nothing lasts past your wedding day. Your venue will be used by another couple, your dress will hang in your closet, the cocktails will (most likely) be gone. Most importantly, you'll have your spouse, but I hope you also have a collection of images that can remind you over and over again of the covenant you entered on your wedding day. That's the point of the wedding after all. My shooting approach is laidback and collaborative. I ask questions about what you most admire in one another, what things you're looking forward to in marriage, and who farted first. By helping you focus on what it is that you treasure about your almost-spouse (and memories that make you double over with laughter), we create a space during your wedding day to truly celebrate the wedding covenant. I don't run through a shot list, because your relationship is unlike any other. Every photograph I take is directed by your natural interactions with one another, combined with my creative direction. More than anything, I want you to look at your wedding images and think, "This is us. These feel like us." My undergraduate degree is in history, but I could never quite find my perfect fit digging through archives and arguing the economic ramifications of this treaty on that country. But where I found my perfect fit is in documenting the beauty of marriage. Each wedding collection is crafted to offer you everything you need for your wedding day. Consultation meeting: completed over Google Hangouts, a consultation meeting is about 30 minutes and serves as a time for us to get to know one another better and discuss the many details of your wedding day. A detailed questionnaire and schedule will be filled out before the consultation. A day-of schedule: To ensure that every important moment is covered in the 9 hour spread, I help create your wedding schedule based on your goals and visions of the day. Photo gallery: Your images are delivered through Pixieset, and the collection includes full personal printing and distribution rights to every high-resolution photo in your wedding gallery. You may print and hand out your photos, personally, for as long as you wish. 2 photographers: Collection A includes two full-time photographers. Collection begins at $4,500. Travel fees and PA sales tax are the only additional fees. Collection B is crafted identically to Collection A, but includes only one photographer, Autumn. 1 photographer: Collection B includes Autumn as your photographer. Collection begins at $3,750. Travel fees and PA sales tax are the only additional fees. A 50% retainer is required at the time of the contract to secure a wedding date for all collections and vendors. Rather unsurprisingly, my engagement shoot philosophy runs similarly to my wedding philosophy: the focus should be on making your love and relationship come through in the photographs and nothing else. Engagement sessions run about 1.25 hours long and can include as many locations, outfits, or experiences you can think to include! I don't run through a shot list, and I feed off of your natural couple vibe because—more than anything—I want you to look at the images and think, "This is us." If you've booked your wedding with me, your engagement shoot is $500 with added travel fees and taxes. If you're only interested in an engagement shoot, they are $600 with added travel fees and taxes. Rather than ask Google to find you a videographer that matches my style, I've found one for you. You can see a collection of Sam's work here. And if you're into seeing my photos around the internet, a collection of my featured work can be seen on Junebug Weddings, Vogue, WeddingWire, The Knot (print), VSCO, Wild Darlings, Looks Like Film, Ever Ours, The Lovely Find (1, 2), Juno & Joy, Oh Lovely Day, Lemonade and Lenses, Swooned, Woodsy Weddings, and more. Get your photos off of your computer and printed forever! 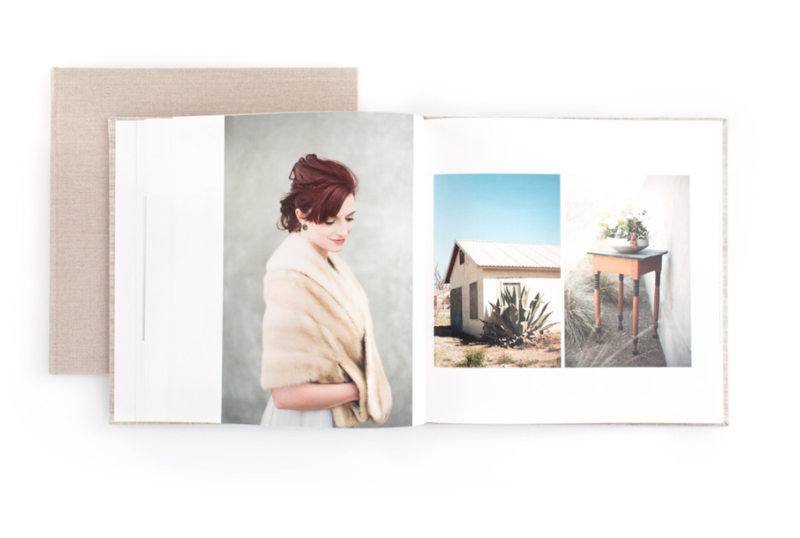 I personally design and develop each wedding album for our clients and print through RedTree Albums. RedTree is a phenomenal printing company, and I can do nothing but rave about their quality and exceptional materials. Your wedding photos deserve to be stored someplace else besides the depths of your hard drive. If you're interested in adding a wedding album to your wedding coverage, you can find more information here.